On Wednesday, Hillary Clinton appeared at the 2017 Code Conference (full video and transcript; excerpts below). 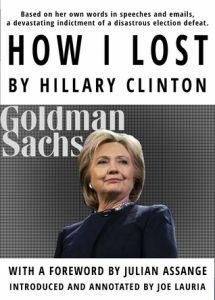 Vox reports: “Hillary Clinton blames everyone but herself for her 2016 loss.” From the book description: Clinton’s “own words, found in this book, tell the real story of how it happened. The title includes Clinton’s byline as she has unwittingly written the story of her own defeat in her speeches and her emails and those of her campaign staff. “At a time of widespread dissatisfaction with business-as-usual politics, the Democrats chose to field a quintessential insider. Her campaign dwelt little on policies, focusing overwhelmingly on the personality of her opponent. That this strategy was a failure is an understatement. Losing an election to someone with as little competence or support from his own party as Donald Trump marked an extraordinary fiasco. The refusal of the Democratic leadership to identify the real reasons for their defeat is not just a problem of history. If Democrats persevere with a politics that prioritizes well-off professionals rather than ordinary Americans, they will leave the field open to right-wing populism for many years to come. Lauria is a veteran foreign-affairs journalist. He has written for the Boston Globe, the Sunday Times of London and the Wall Street Journal among other newspapers.